Going into this match, we were missing most of our first team defense, which was a huge concern for me. I wondered if we would be able to pull off a win, even if it was at home to the team in 17th place. But with a little luck and maybe a little trickery, we managed to get the three points. Crisis averted. Allegri has lined up some curious choices for me before, but tonight’s were particularly eyebrow-raising. Amelia was able to start in goal, to the chagrin of Flavio Roma, but to the relief of those of us already concerned about the defense. Speaking of the defense, it was Bonera, Mexes, Silva, and Taiwo. I was fine with the center choices, but for some reason Taiwo started on the right, with Bonera on the left. Puzzling. Then he left Aquilani off the starting lineup for Seedorf, and risked Nocerino just coming back from injury (although I would have done the same there.) He also chose to start with Robinho over Pato. I like to think the game showed that his choices perhaps should have been different, but maybe it was a bit of everything that made this lineup struggle. It was not long after that I noticed that Taiwo and Bonera swapped sides. That seemed to help a bit, but in the 35th when Siena were on attack, the other 3 defenders were all back in position, and Taiwo was just standing around a little further up the field. I guess it’s true that they say he doesn’t understand how to defend. Which is a shame, because in the 38th, he was forward and took a great shot that went from long range that went over the crossbar. I’d really like to see him make one of those someday in the red and black. The other event that made the stat sheet in the first half was a yellow card for Gazzi on a late challenge on Boateng. Yes, it was seriously that kind of half. The second half got a little more interesting. Seedorf earned himself a yellow in the 50th, his pace still seems to hurt us as much as his brilliance blesses us. There was a Siena attack that was 3 on 3 that looked a little threatening, but the shot was easily saved by Amelia. So in the 54th, Milan earned a corner. Seedorf must have looked over to the sideline and seen Aquilani standing there, ready to sub on for him, so he took a great corner and Nocerino was able to put it in the back of the net. 1-0 Milan. The goal from his corner didn’t change Allegri’s mind, though, Aquilani replaced Seedorf in the 55th. D’Agostino also came on for a tired Reginaldo in the 56th, then Grossi on for Gazzi in the 60th. It was in the 63rd that controversy ensued, Boateng was running in, one on one with Brkic. The end result was Boateng down, clutching his leg, with Brkic outstretched on the ground. But watching the replays, it looked as if Boateng was auditioning for Barca, as I saw no contact whatsoever. Still, Brkic was given a yellow, and Milan was given a penalty. Ibra took the penalty well, as he is prone to do, and it was 2-0 Milan, but I’m not proud. Shortly after that, in the 65th, Pato came on for Robinho, and created quite a few chances & epitomized the concept of “fresh legs.” In fact, in the 72nd, he had a nice crack at a shot that was unfortunately cleared by the Siena defense. In the 73rd, Allegri surprisingly used his 3rd sub to bring Emanuelson on for Boateng. And sure enough, in the 75th, Taiwo was ominously injured. But god bless him, he was able to get back in the game and play, lest we had been down to 10 men. Amelia made a nice save, his most dangerous of the game, in the 78th, and then Destro finally came on for Brienza, maybe too little, too late. Nocerino looked for a header in the 87th to make his second on the night, but it was just wide. And basically, that was the match. Milan managed 66% possession. Not terribly noteworthy, but we achieved the desired result. 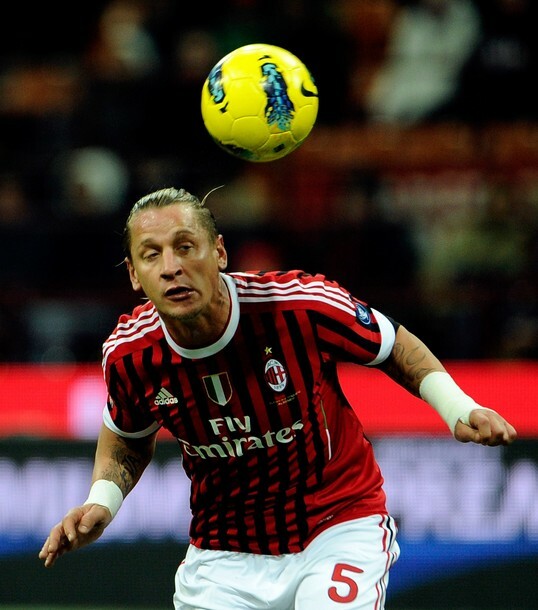 Seeing Mexes with his hand still wrapped up from his injury reminded me of the fragility of our back line right now, I am looking forward to getting Nesta back, hopefully Abate’s injury is minimal, and Abbiati has already begun training again. Hopefully our crisis in the back will be resolved soon enough, but for today, Nocerino’s goal and Boateng’s acting skills ensured us the 3 points. Crisis Averted.